My sister-in-law has a Halloween village that I have envied for over a decade. I wanted to recreate the idea of a Halloween village without spending the money or taking up the storage space that our Christmas village requires! When Michaels asked me if I wanted to try out their carveable craft pumpkins as part of The Great Pumpkin Challenge, I knew just what I wanted to do with them. 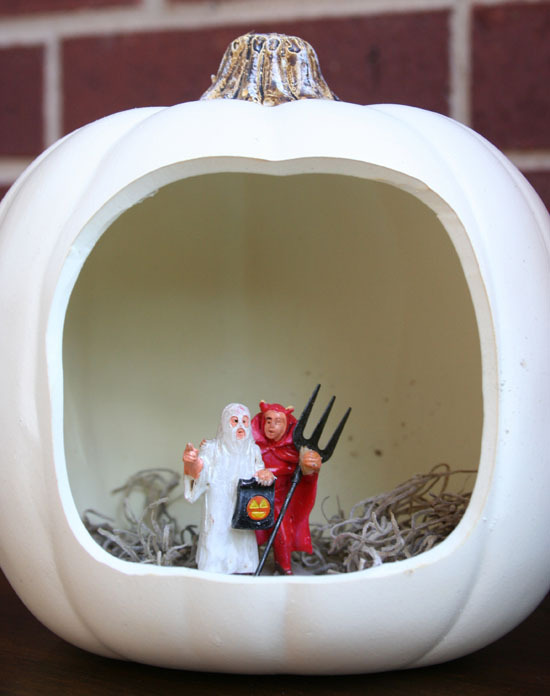 Michaels has a fun Halloween village of their own, so I picked up a few of the smaller, inexpensive accessory pieces to create some fun Halloween scene diorama pumpkins. I love all of the cute trick-or treaters and my daughter, whose birthday happens to be on Halloween, loves that she can actually count down the days until her birthday using the witches countdown calendar. These will be even spookier at night with the fun shadows caused by the little votives that are tucked in the back. These pumpkins were really easy to carve and even easier using the hot knife. I have to admit that I was pretty nervous before trying it, and it is definitely not something you want to use with little kids around, but they cut the craft pumpkins smoothly and easily and without all of the slippery goo that usually accompanies carving real pumpkins. I think we may buy a few more, let the kids draw the design that they want cut out, and then let them decorate the pumpkins after Dad does the carving. My hubby loves to carve pretty intricate designs and I can already promise that he is going to love this tool! If you want to give craft pumpkins a try, all Michaels locations are hosting a Great Pumpkin event on Saturday, October 5 from 1 p.m.-3 p.m. For only $6 your kiddos will receive a 9" carveable pumpkin to decorate in the store. There will also be a free face painter on hand for even more fun! I think you should get your face painted to look just like your pumpkin! And if you want to leave the carving to someone else, Michaels offers custom carved pumpkins that you can order right in the store, with a variety of designs to choose from! If you live someplace warm, like me, where real carved pumpkins mold within days, these craft pumpkins are a great alternative. You don't just have to carve them either! 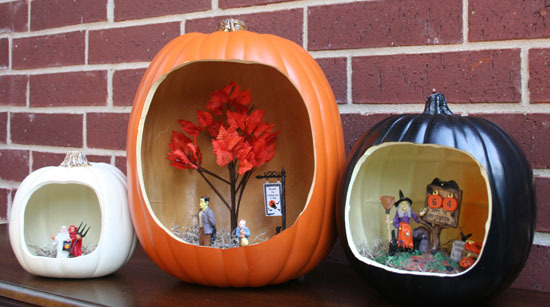 You can paint them, add embellishments, make your own Halloween village, or more! 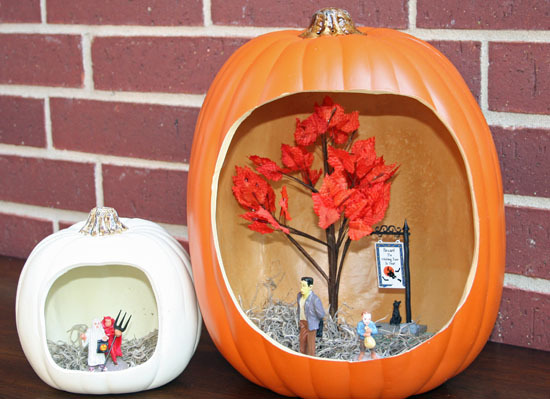 You can check out more fun ideas for decorating craft pumpkins over on Michaels Pinterest Page! ***Michaels provided me with the materials to create this project, all opinions are my own and no other compensation was received for this post. super cute! You really should be proud Lorie! This is SO adorable! a MUST-do for children this holiday season, very cute! thanks for sharing Lorie!